Khayyat Sarkar, Z., Khayyat Sarkar, V. (2018). Removal of Mercury (II) from Wastewater by Magnetic Solid Phase Extraction with Polyethylene Glycol (PEG)-Coated Fe3O4 Nanoparticles. 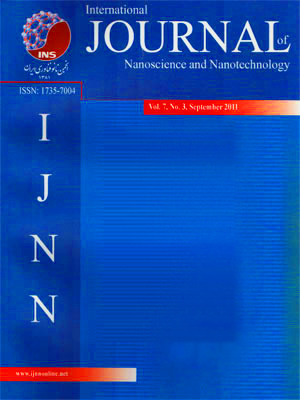 International Journal of Nanoscience and Nanotechnology, 14(1), 65-70. Z. Khayyat Sarkar; V. Khayyat Sarkar. "Removal of Mercury (II) from Wastewater by Magnetic Solid Phase Extraction with Polyethylene Glycol (PEG)-Coated Fe3O4 Nanoparticles". International Journal of Nanoscience and Nanotechnology, 14, 1, 2018, 65-70. Khayyat Sarkar, Z., Khayyat Sarkar, V. (2018). 'Removal of Mercury (II) from Wastewater by Magnetic Solid Phase Extraction with Polyethylene Glycol (PEG)-Coated Fe3O4 Nanoparticles', International Journal of Nanoscience and Nanotechnology, 14(1), pp. 65-70. Khayyat Sarkar, Z., Khayyat Sarkar, V. Removal of Mercury (II) from Wastewater by Magnetic Solid Phase Extraction with Polyethylene Glycol (PEG)-Coated Fe3O4 Nanoparticles. International Journal of Nanoscience and Nanotechnology, 2018; 14(1): 65-70. Kimiya Pajooh Afagh-e- Kavir Research & Technology Company, Yazd, Iran. The presented study investigates application of polyethylene glycol (PEG)-coated Fe3O4 nanoparticles as an magnetic nanoadsorbent for magnetic solid-phase extraction (SPE) and the selective removal of toxic heavy metals such as mercury (II) from aqueous solutions and their determination using graphite furnace atomic absorption spectrometry (GF-AAS). The Fe3O4 magnetic nanoparticles were synthesized using co-precipitation and characterized by Scanning electron microscopy (SEM), X-ray diffraction (XRD) and vibrating-sample magnetometer(VSM). The influences of analytical parameters including pH andeluent type, concentration and volume have been studied and optimized. The optimum pH required for maximum adsorption was found to be 6 for mercury. SEM images showed that the particle- size was about 24 nm and no marked aggregation occurred. XRD indicated the sole existence of inverse cubic spinel phase of Fe3O4 magnetic nanoparticles. VSM patterns indicate superparamagnetic of Fe3O4 magnetic nanoparticles. The results obtained from the recovery test showed the capability and reliability of the method for the removing mercury (II) from wastewater.